The dashboard component is a new addition to Control, and one that we feel sure you will find useful. One of the real-world challenges brought to the Cyrious team was how to allow the varying users to consolidate what they do and monitor most onto one screen. A dashboard in Control is a window that a user creates (or customizes) to bring together the areas of the program most frequently used. A dashboard is fundamentally a window in Control. There are several actions associated with this new feature (explained below) that will help to organize the information in the dashboards, so please take advantage of these. You can also customize the instruments that are in the default dashboards for your own view. These buttons will allow you to add or remove columns in the dashboard view. The number of columns you can add is unlimited; however, we suggest having no more than three columns because the information in the instruments begins to get harder to read. Two or three columns seem to work very well for most people. If Not Shared is visible, this means the current dashboard view is not shared; it is only seen by the creator. Shared means it is visible by everyone. A custom dashboard can be created by modifying an existing one and clicking “Save As”. A newly created dashboard is not shared by default. After the initial Save, you are then allowed to Share it, and must save the dashboard again to put that change into effect. Clicking the Save button at the top right will drop down two options. Save Dashboard will save the changes you have made to the current dashboard under the same name. Save Dashboard As will allow you to save the current dashboard under a new name. The Dashboards available to users will be separated into three different sections as shown in the picture below. Each section will be described in further detail below this picture. The first section is for Dashboards that are created specifically by the user that is currently logged in . Baton Rouge Accounting and My Personal Dashboard are the only two dashboards that were created by this user. These dashboards (as long as they are Shared) are able to be edited and deleted by other users. The second section is for Dashboards that are created by all other users of Control . These dashboards, and the instrument on them are not able to be edited. You are able to make a Clone of the Dashboard however by using the “Save Dashboard As” option, located in the upper right. The Home Screen in Control is a dashboard that each user could customize. 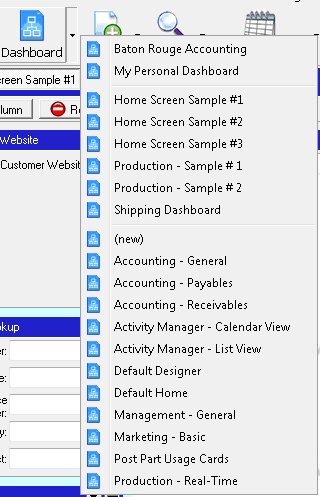 For example, if you are the production supervisor, you might want a view of all orders in production on the Home Screen. With Control dashboard technology, you can simply add an Order Explorer Instrument and set it to display this. You cannot overwrite the default Home Screen, but you can click on Save > Save Dashboard As, enter a new name (for example, Jim's Home Screen), and set this as your Home Screen. Then you can make new changes, but remember to save them before closing Control. Quick Products Instrument – This instrument provides the Quick Products list to quickly create an order or estimate. Quick Lookup Instrument – This instrument provides the Quick Lookup edit boxes for quickly opening orders, estimates, customer records, etc. Control Menu Navigator Instrument – This instrument provides the circle of navigation choices the user can click on. The BMS Menu Navigator Instrument provides a menu system more familiar to BMS 7.x and earlier users. Tips Instrument – This instrument provides access to the tips library.